Throughout the Month of August we will be profiling our SAIA KZN AWARD Winners. 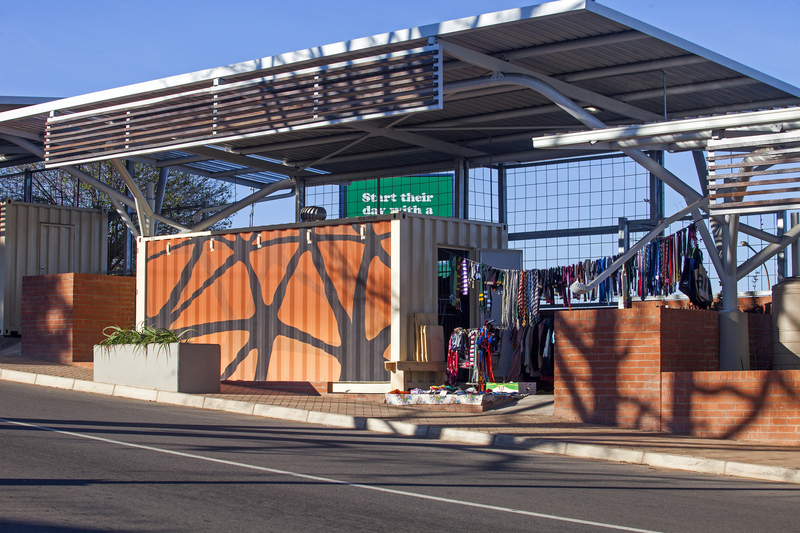 The project is part of the Hammarsdale Public Realm Upgrade, which is a three phased project to improve facilities for commuters and informal traders within the commercial Town Centre of Hammarsdale. Phase one consists of new trading shelters for those who are currently trading from containers. The shelters consist of a series of over-sailing roofs over platforms which house the new, fully fitted converted shipping containers. Each container is equipped with electricity, plumbing, display shelving and, depending on the retail activity, with gas burners and sinks. Seating areas are provided outside each container for traders and their patrons. The design concept was “Tree Architecture” and the structural elements were designed to resemble a tree with the tapered concrete column as the tree trunk base, the circular hollow section steel column continuing as the trunk, the circular hollow section steel struts/portals as the branches and the roof resembling the tree canopy. The idea of a central steel column holding a cantilevered three dimensional space frame canopy was to free up the space below for the steel containers and trading as well as pedestrian access along the pavements. The structure is therefore a cantilevered three dimensional portal space frame steel structure with central supports at 12 metre centres. Tubular sections were used for their torsional resistance, structural strength and to meet the Architectural design concept. 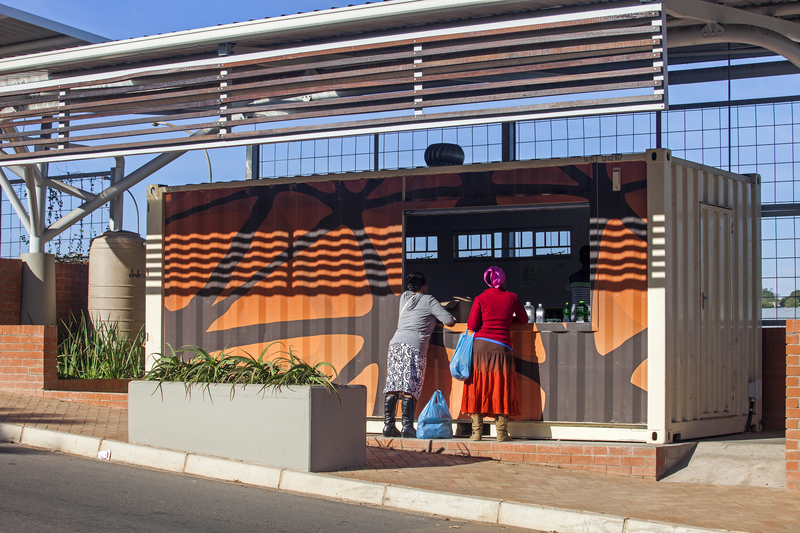 The shelters have solar panels that generate electricity for interior lighting as well as ambient lighting below the roofs. 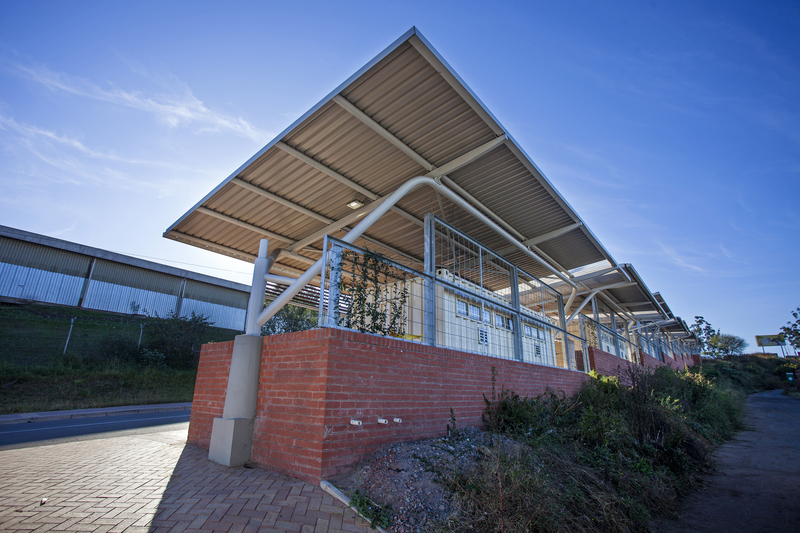 Timber screens suspended from the roofs provide solar control on the exposed north side. Each container has a rainwater collection tank to irrigate a permaculture garden into which vegetables can be planted. The south-facing wall has “green screens” which act as a security barrier and softens the hard edge adjacent to the taxi rank. One of the major challenges was the steep narrow site which sloped in two directions forming part of the road reserve as well as the multitude of electrical and telecommunication services running below the site. Most of the services were unknown to the respective service providers so the Contractor had to carefully excavate proving trenches to expose the services and protect them from damage during construction. Additional manholes and cable sleeves were provided to protect and provide access to the services post construction.